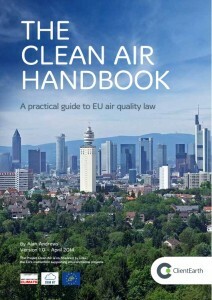 The environmental law group ClientEarth has published a guide to EU air quality law called the The Clean Air Handbook. The purpose of the handbook is to provide individuals, groups and lawyers with a straightforward, easy to use guide to EU air quality. The guide gives an overview of EU air quality legislation and provides practical tips on how relevant aspects of EU law can be used by those concerned about air quality in the UK.